Thanks to a family friend, this lovely book found its way to our home this Christmas. I have not read it yet, and know nothing about the content of the book. But I saw that it was beautiful the second after it emerged from the wrapping paper, and it felt good to hold it in my hands. Of course, I also saw that it is not new, as it has some wear to it both front and back, but that adds to its charm. When opening the front cover I discovered these lovely endpapers, which took me back to our childhood school library. The first leaf has come loose, and I am debating whether to tape it or not. At the moment it has been left as it is. 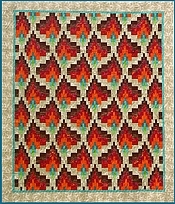 Also, the old fashioned pattern reminded me of tone on tone quilting fabric. On the next page was another surprise: the year of printing. This is one of the reasons I think paper books are superior to digital ones: someone can still hold them in their hands and enjoy their beauty 164 years after they were printed. As I mentioned above, I have still not read it, but the first page looks promising. It has only two sentences, – the second one even continues on to the next page. There will be a lot of untangling to do, and I will probably expand my vocabulary as I already see a couple of words I will have to look up. 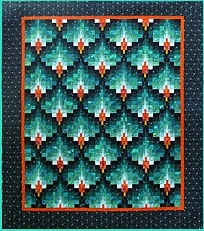 When closing the book, I also noticed there was a pattern of very fine blue and red lines on the leaf ends. According to Wikipedia, Tauchnitz was a Leipzig based print business and publisher, providing a series of affordable reprints of works of American and English authors. The books were like mass market paper backs of their time, although paper back is not something that comes to mind when handling this book. 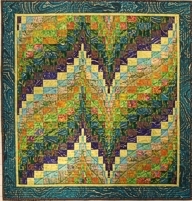 Roberta Burgess is writing a story about a quilter, and is posting a new chapter every day. 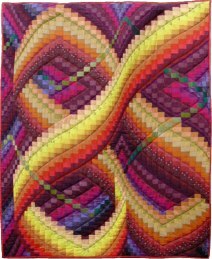 In between postings, quilters and writers are invited to make suggestions on what happens next, and how the plot is to evolve. Have you ever bought a book just because you were captivated by the great look on the cover? And then found that it was a really interesting read as well? I get those marketing e-mails from Amazon where they tempt me to buy books and DVDs, and where their choice offer is calculated from what I have bought before. This is very effective marketing, of course, because I tend to buy more of the same style of books that I have enjoyed before, – while the new and unknown is not likely to be as tempting. After I bought a French DVD for my daughter, French films began to appear in these marketing posts. The one in the photo below, Persepolis by Marjane Satrapi, caught my eye. I read up on it, and found there was also a book which the film was based on. I always like to read the book first, and then watch the film afterwards. That way I know the characters beforehand, and do not have to keep track of who is who at the beginning of the film, – sometimes that can be very confusing and requires a lot of attention. Anyway, I bought both the book and the film. I have read the book, and have not for one moment regretted the purchase, even though comic books are not my usual style, and the subject, – growing up in Iran, – not one I was particularly interested in beforehand. I even bought a second book by the same author to enjoy in the near future, – after I have seen the film of this one. I also get marketing e-mails from AbeBooks after buying a used book through them. They often present some interesting collections in their newsletters. One of the latest I have received happened to be about captivating covers. I may even want ot buy it one day, although I have no idea of what the book is about. But I like the cover. Here is their entire collection. Previously they have presented a collection of unusual book bindings, – well worth looking at in my opinion, if only out of curiosity. There are very few of those that I could ever afford to buy.